A second inspiration for this dish is my love the taste of habanero pepper, in spite of its sometimes overwhelming heat. This recipe uses two very hot peppers; in fact, these two are the hottest peppers that I know to be used regularly in cooking recipes (100,000-350,000 scoville units). 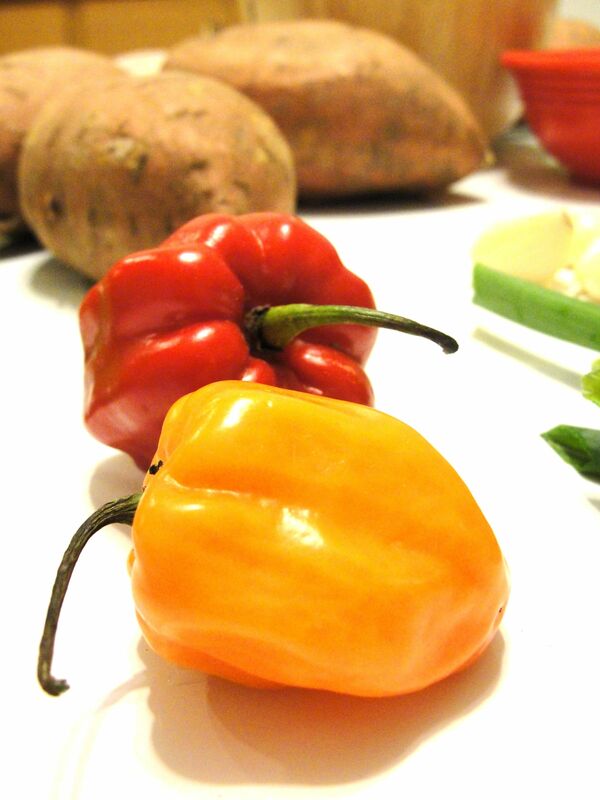 I chose one habanero and one scotch bonnet, a related and similarly hot pepper. Be extremely careful when handling these peppers, once cut; if mishandled, you may find yourself in pain for hours. If you start to feel the tingling heat in your fingers from touching the pepper, you can dip your fingers in milk to sooth them, and/or use a toothbrush to clean them if you get the oils under your fingernails. Some people like to wear latex (or similar) gloves, however, I manage to handle these by just being careful to only touch the waxy outside of the pepper, and use only utensils to touch the insides when cutting, seeding, removing the veins and, mincing. 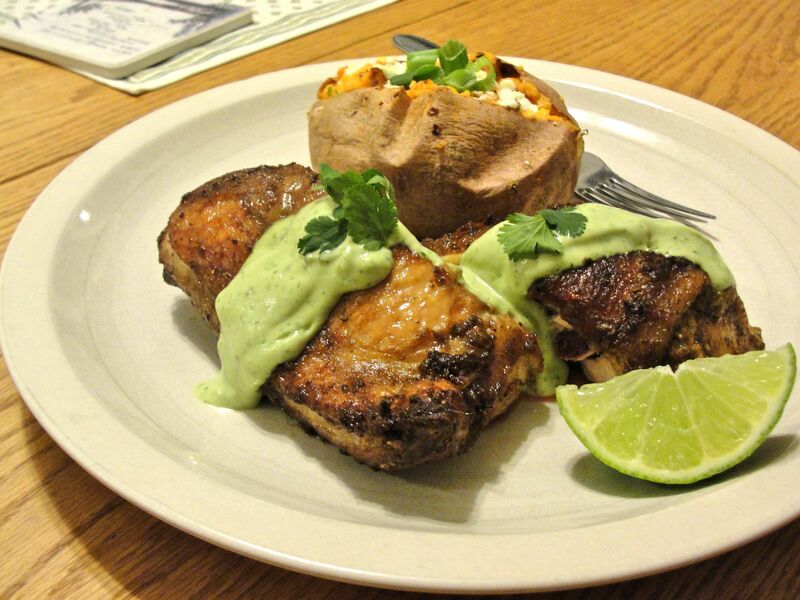 For this dish you could either use one whole chicken, cut up, or 4 leg quarters, as shown here. The first step (a day or two in advance) is to prepare a marinade and to marinate the chicken (e.g., in a large, strong Zip Loc bag) for 8 to 40 hours. 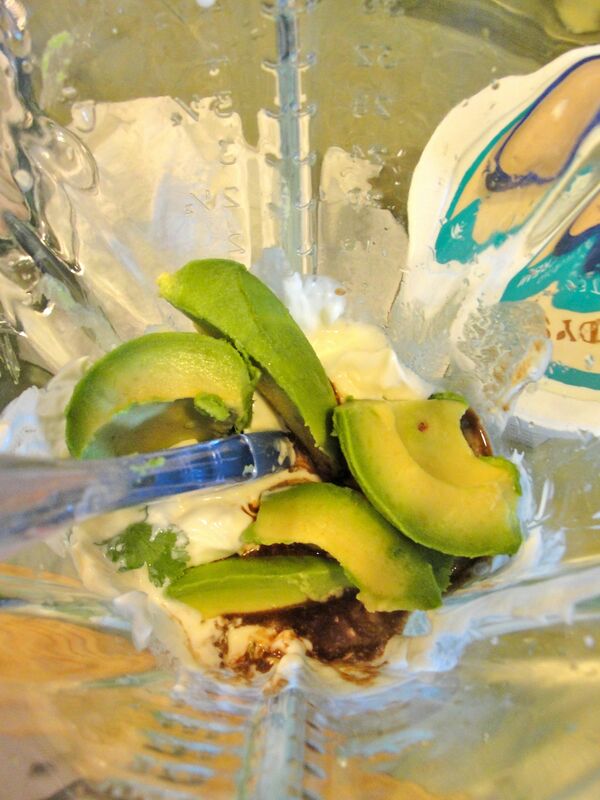 Combine marinade ingredients and thoroughly blend in blender or food processor. To bake the chicken, place it on a broiler pan, with water in the bottom (to keep rendered fat from burning and smoking), and bake for approximately 1 hour at 375°F. 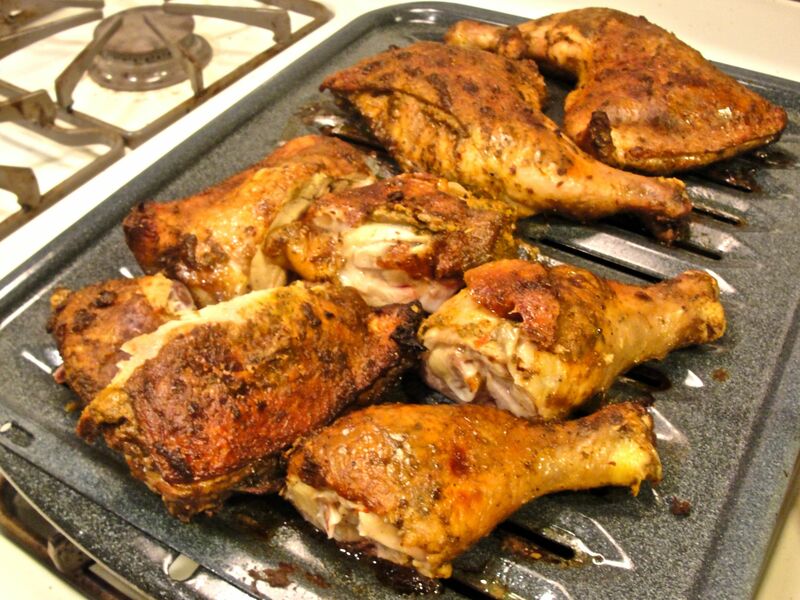 If necessary to crisp the skin, rub or spray chicken with oil and finish under the broiler. 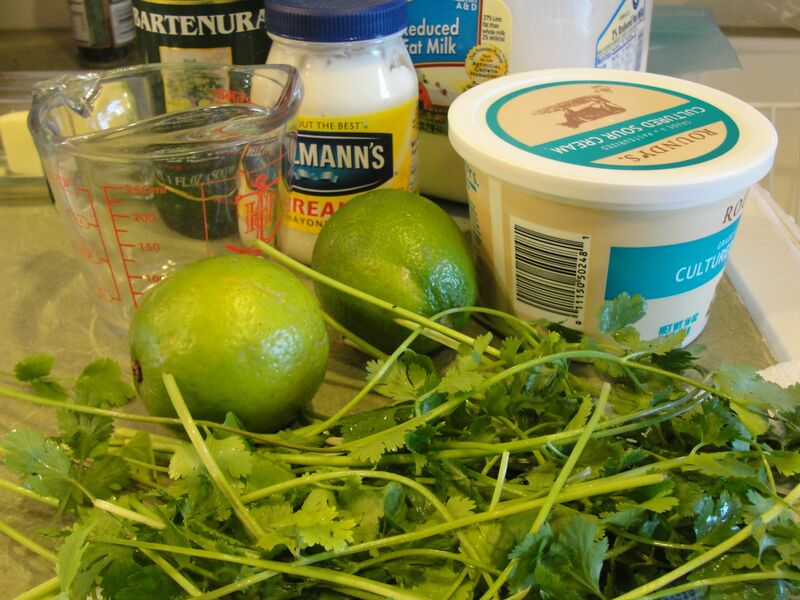 Given that I meant the chicken to be somewhat spicy, while it was baking, I prepared a soothing cream sauce with cilantro, lime and ripe avocado. Once baked, I cut each leg quarter into 3 pieces: a leg, and two thigh pieces. Use a chef’s knife or cleaver so that you can cut through the bone. I served the chicken pieces, two per guest, topped with the sauce and accompanied by a Twice Baked Sweet Potato. Overall, this dish was pretty good and fairly mild or just approaching what many Americans might call “medium” in heat. Next time I’ll vary the pepper (perhaps adding a bit more) and limit the amount of mint so that it doesn’t dominate the flavor. I used 1/2 cup of mint leaves (before chopping); the amount (1/3 cup) in the marinade ingredients above is my revised suggestion. 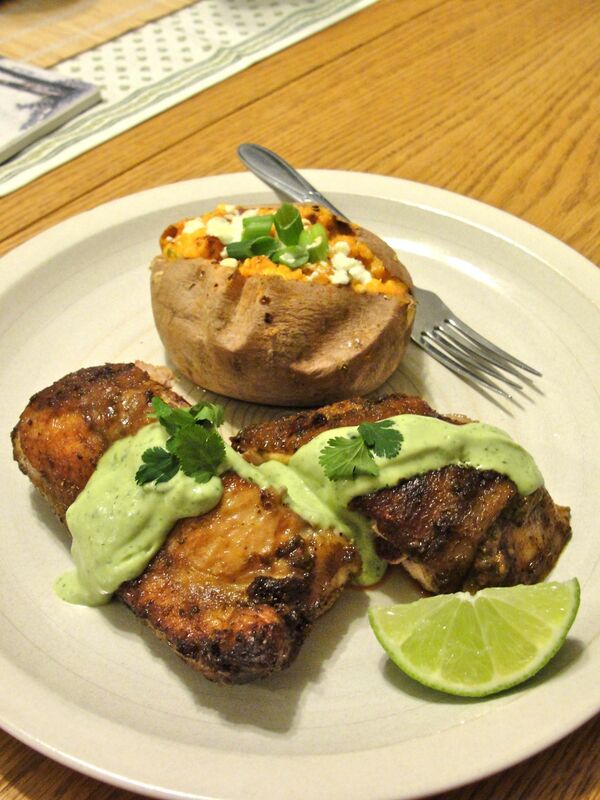 This worked well, and still wasn’t too much spice for 8 chicken thighs. I have to say – I’ve been looking for a recipe for this sauce for a while and yours seems really yummy! I can’t wait to try it! I love them! But I always find they have a good base (for a recipe) and I always have to add more herbs and spices to make it flavorful enough! The flavors here sound phenomenal. I may have to take a whack at the idea of this dish. Thanks.